Hyundai Asia Resources, Inc. (HARI), the exclusive distributor of Hyundai vehicles in the Philippines has adjusted their pricing taking into account the Tax Reform for Acceleration and Inclusion or TRAIN law. After holding back last month, these new prices are effective February 15 and with it, carries an upward movement in the suggested retail price. Unlike other carmakers that increased their prices across the entire model range, Hyundai has opted to keep price-sensitive models as they were before. Base variants of the Accent and Elantra, as well as the entire Eon range have kept their prices steady post-TRAIN. The rest of the line-up isn’t so lucky. 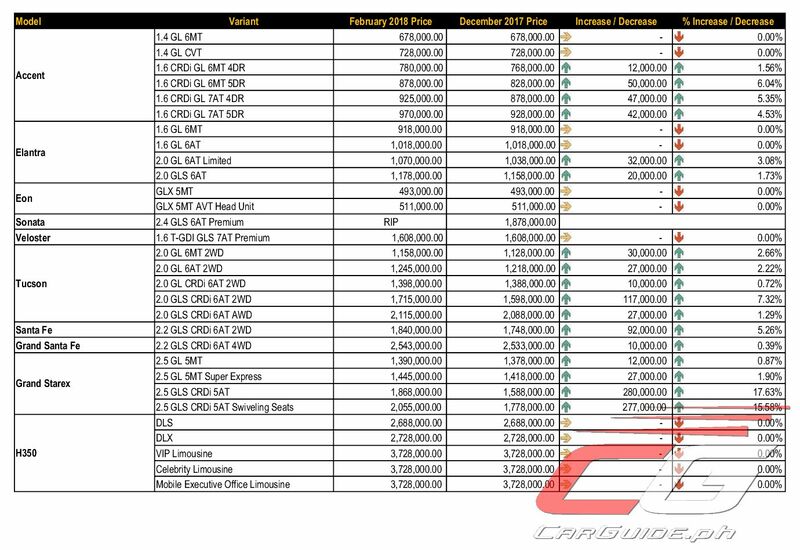 Diesel variants of the Accent are all up from P 12,000 to as much as P 50,000 due to the new tax. This equates to a price increase anywhere between 1.5 to 6 percent. The hardest hit variant is actually the TNVS-popular 1.6 CRDi GL hatchback which is now priced at P 878,000 from P 828,000. On to the Elantra, the 2.0-liter models have gone up 1.7 to 3 percent, with the 2.0 GL Limited getting slapped with the highest increase (P 32,000). 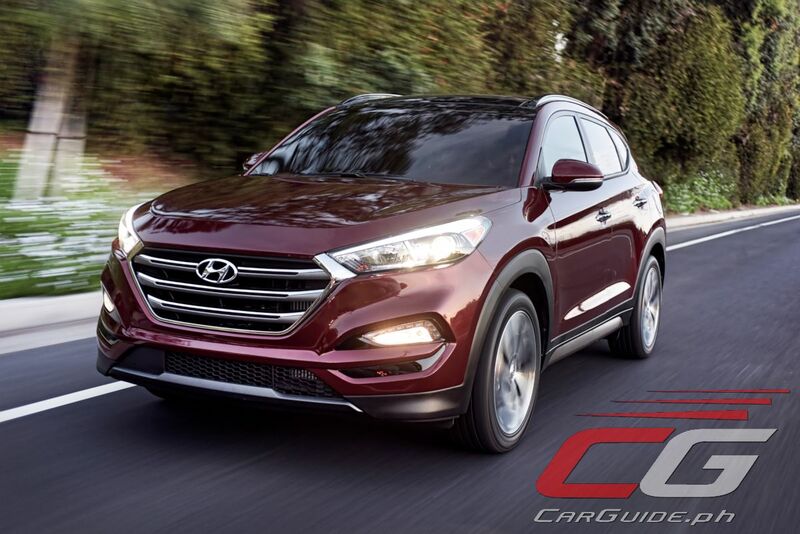 The Tucson, Hyundai’s compact SUV offering gets hit with an increase ranging from a very modest 0.72 percent to as much as 7.32 percent due to its tax bracket. As predicted, the variant with a December 2017 SRP in the P 1.4-2.0 million range gets hit the most. 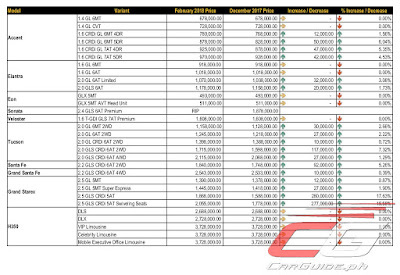 In this case, the 2.0 GLS CRDi 2WD has gone up P 117,000 to P 1,715,000 (from P 1,598,000). It’s almost the same case with the Hyundai Santa Fe which goes up 5.26 percent to P 1,840,000 from P 1,748,000 last December. The larger Grand Santa Fe model isn’t as badly hit, going up a mere 0.39 percent (P 2,543,000) compared to its price two months ago. Moving on to Hyundai’s bread-and-butter Starex model, it’s up across the entire range. However, the fleet-friendly 2.5 GL and 2.5 GL Super Express are up just 0.87 to 1.90 percent respectively. It’s actually the leisure models, those equipped with a CRDi engine and an automatic transmission that have gone up—by as much as 17.63 percent this month. For HARI’s niche models, the Veloster Turbo keeps its price this month due to remaining 2017 stocks while the Sonata has bid adieu. Compared to our predictions last December, we were off by 1.96 percent at the most (average variance is 1.25 percent). We actually predicted higher prices for the Eon, Accent, and Tucson but it seems HARI has found a way to pass on a bit more savings to its buyers starting this month. We were off just 0.79 percent with the Accent and 0.98 percent with the Tucson. Sumalangit nawa ang kaluluwa ng sonata. Hi uly, seriously, what does RIP for sonata mean? Discontinued for 2018? That engine is worth every penny if you're not satisfied with the 1.5l gas engine of other subcompacts. Did Hyundai just phased out Creta even before it was released in the market? Did the product planners got scared with the upcoming and existing competition such as cx-3, vitara, rush, xpander and brv? I think the new accent doesn't come in diesel engine anymore. And if I'm right, it will be a big blow to Hyundai's sales performance. Better they produce a car that will compete with ecosport and mobilio but with a diesel engine so that they could at least offer something different and in demand in our car market. From my understanding they had difficulty bringing the price down to the SRP they priced a few years back. That’s why they couldn’t bring it in. Hi Uly, I think you are right, I have just read in one article that importing Creta from India is costly. And it also doesn't help that the Korean Won value is high. Adding insult to injury is the fact that Hyundai factory in Korea encounters multiple employee strikes. Their sister company Kia is not also performing well. Once Hyundai releases the new Sta. Fe, there will be a void in between Tucson and Sta. Fe, because the new model is as big as the current Sorento. It will be another missed oppurtunity again for them. So much RIPs in their model line up; e.g. I30, I20 Cross Sport, Creta and I10, Veloster and Genesis Coupe, Sonata. And soon the Elantra. I think Starex, H100, Eon and Old Accent are some of the models that will not be phased out. MANILA, Philippines – The first time Maria Fe Perez-Agudo met the male bosses of Korean carmaker Hyundai, they gave her cold treatment meant to intimidate. "In a meeting with 10 or 12 male executives in Korea, they looked at me and they only had one question. 'You are a woman. What do you know about cars?'"